The purpose of the chapter is to show how the methods for high-level WIS design, i.e. 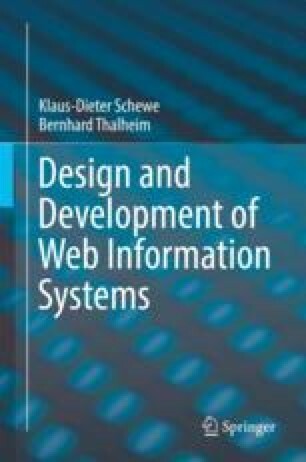 strategic modelling discussed in Chapter 2 and the storyboarding method from Chapters 3 and 5, impact on different categories of web information systems. The main categories investigated in the chapter concern e-business and e-commerce, community and group systems, entertainment and gaming, identity and personal presentation systems, learning and edutainment WIS, and information services. For each of these categories the most important aspects of the methods are discussed and tailored to the specific requirements of the respective category. This concerns branding, linguistic and communication analysis, life cases and actor modelling, and storyboard development.